How much a piercing hurts will partly depend on where it is located. Common earlobe piercings usually don’t hurt much because the area is fleshy. 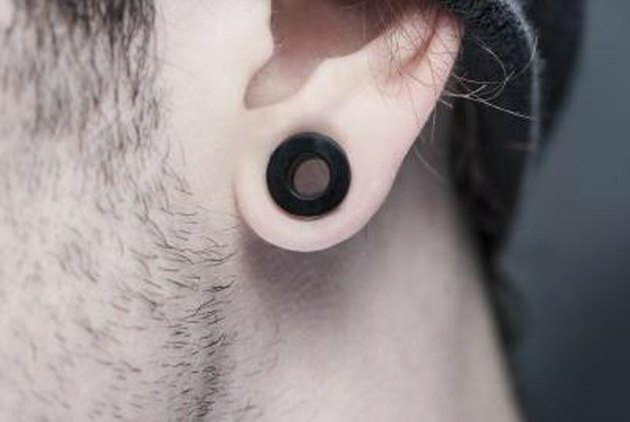 Piercings at the top of the ear or the inner portion of ear cartilage might hurt more, however. If the pain continues for more than a couple of days, you could be getting an infection. Inspect the area using a mirror and look for signs of pus. Redness is common, but it should get better, not worse, as the days go by. Clean the area around the piercing using a cotton swab and hydrogen peroxide. You can also wash your ear with soap and water. This will help to prevent infections that would make the pain worse. You can also feel pain if debris gets caught between the earring and the earlobe. Rinse the area well when in the shower to dislodge anything that could be making the pain worse. It’s a myth that you need to turn or move your piercing constantly when you first get it. In fact, the truth is that you should not touch the earring at all until it heals completely, which can take up to two weeks. According to PiercingDotCom, moving the piercing hurts the tissue that is already tender. This causes inflammation and can worsen and extend the pain. If you’ve been cleaning the piercing several times a day, stop. The more you clean the area, the more you’ll dry out the skin. This is especially true if you’re using soap, alcohol or other astringent solutions. Dry skin becomes tight and irritated, which could worsen the pain. Unless there’s an infection in the area, you don’t need to clean it more than once a day. It can take up to two weeks for a piercing to heal and you might be sore just as long. Rather than suffering through the healing process, take an over-the-counter painkiller. Try to sleep on your back if you can. Sleeping on your side can worsen the pain because you're applying pressure on the piercing. Don't go swimming or wear earmuffs for at least the first week. Anything that causes friction can increase pain.